ANNANDALE, Va. — A private music teacher in Virginia was released on bond Wednesday morning after being arrested for inappropriately touching at least two students during lessons and other times they were at his home, police said. Jeffrey Cummins, 56, was taken into custody late Tuesday afternoon after arriving from international travel at Dulles International Airport. 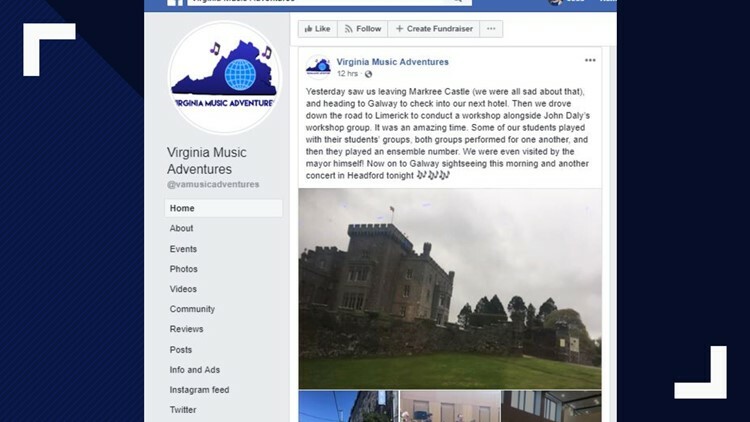 Police confirm Cummins had been traveling in Ireland with the non-profit music school he founded, Virginia Music Adventures. The Virginia Music Adventures Facebook page had been taken down as of 5:30 p.m. Wednesday. “Having the two victims have very similar corroborating stories independently of each other that the commonwealth felt very comfortable taking the charges forward at that time, and that’s when he was arrested and charged with eight counts of indecent liberties by a custodian," Captain Thea Pirnat, with Fairfax County Police said. According to police, Cummins is a private music teacher and gives lessons in his home in Annandale, Va. He's also the owner of two Huntington Learning Centers, one located in Tysons and one in Springfield. Cummins is facing eight felony counts of indecent liberties by a custodian. “We’re concerned just because of the level of access to children there’s potential for other victims, because of the number of years he’s been in practice, it could be that these individuals are now adults and no longer juveniles," Pirnat said. “Today we were made aware of allegations of abuse that occurred inside the home of one of our franchise owners in the Washington, DC area. We are shocked and appalled by this alleged behavior and are actively cooperating with police and investigators to the fullest extent possible. Our mission has always been to provide a safe and supportive environment for students, and although the alleged abuse did not occur inside one of our centers, we have nevertheless made the decision to close these two centers until further notice."